Secretary of State thinks it is a “mistake” for Israel to demand that the PA recognize it as a Jewish state in order to achieve peace. 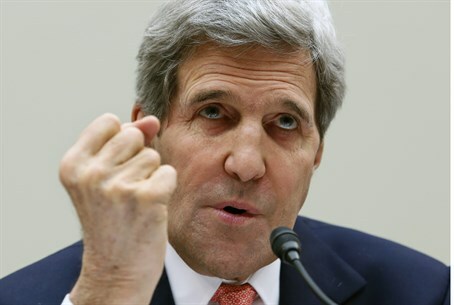 U.S. Secretary of State John Kerry thinks it is a “mistake” for Israel to demand that the Palestinian Authority (PA) recognize it as a Jewish state in order to achieve peace. “I think it's a mistake for some people to be raising it again and again as the decider of their attitude towards the possibility of a state and peace, and we've obviously made that clear," Kerry told the House Committee on Foreign Affairs on Thursday, when asked to clarify the official position of the Obama administration on the issue, according to the Breitbart website. He further said that the issue was resolved in 1947, when UN Resolution 181, which divided Palestine into a Jewish state and an Arab state, was passed. This resolution, said Kerry, referred to "Jewish state" several times. Kerry also said that former PA Chairman Yasser Arafat explicitly recognized Israel's right to exist as a Jewish state. He stood his ground last Friday, saying during a meeting with Fatah youth activists that that there is "no way" he will recognize Israel as a Jewish state and accept a Palestinian capital in just a portion of eastern Jerusalem. On Sunday, he was backed by members of his Fatah party, who unanimously endorsed his rejection of demands to recognize Israel as a Jewish state. On Saturday, Kerry’s spokeswoman Jen Psaki said that the United States believes there is no need for the PA to recognize Israel as a Jewish state as part of a peace agreement. In contrast, U.S. Ambassador to Israel Dan Shapiro recently declared that the PA will be obligated to recognize Israel as a Jewish state under the framework agreement that Kerry is planning to bring to the two sides. Breitbart, which reported Kerry’s comments from Thursday, pointed out two different occasions on which both Kerry and President Obama expressed support for Israel’s demand to be recognized as a Jewish state. “And I join with President Obama in expressing to the people of Israel our deep, deep commitment to the security of Israel and to the need to find a peace that recognizes Israel as a Jewish state, recognizes Israel as a country that can defend itself by itself, and that is an important principle with which the prime minister and the President and I are in agreement,” he said at the time. “We also discussed the way forward to a two-state solution between Israelis and Palestinians. And I very much welcomed Bibi’s words before I spoke. I’ll be meeting with President Abbas tomorrow, and I will have more to say on this topic in the speech that I deliver to the Israeli people tomorrow. But for now, let me just reiterate that a central element of a lasting peace must be a strong and secure Jewish state, where Israel’s security concerns are met, alongside a sovereign and independent Palestinian state,” Obama said.